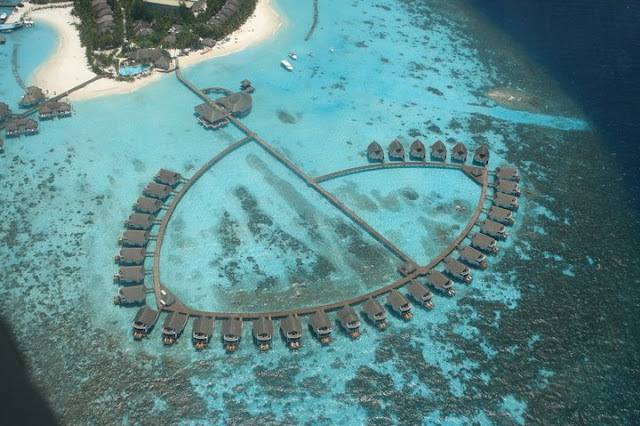 Before I begin, I don't have kids but Centara Grand Island Resort & Spa Maldives certainly appealed to the kid in me. Not just because of the gaming equipment in some of the villas, but also because of the real shipwreck on the house reef. To top it off, there are also two separate clubs for kids and teens (respecting the fact there's a vast difference between what a six-year-old wants and what a 13-year-old wants). This certainly seems like a company that has it all figured out. The island itself is a typically beautiful Maldivan one: Tropical vegetation and coconut trees line the shady paths linking the beach villas. 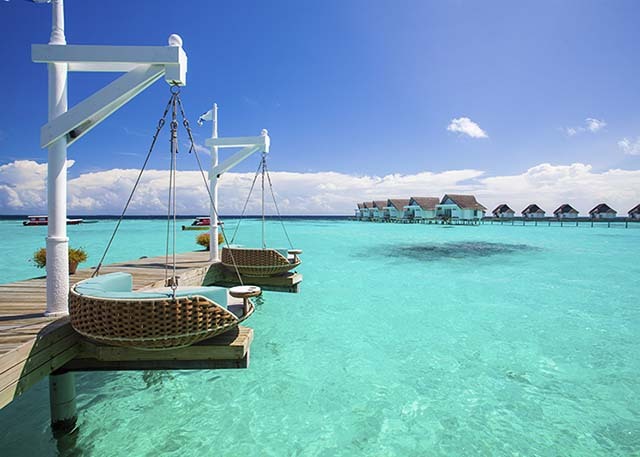 The majority of the resort comprises of water villas stretching out across the lagoon from three separate jetties. The shallow, turquoise lagoon boasts an excellent house reef in close proximity to the shore. Not only is the coral in pretty decent condition, but also the submerged shipwreck is easy to access (unlike others in the area such as Kuda Giri shipwreck, which goes down to 40m and there can be a very strong current there). Parts of the Centara wreck are shallow enough for snorkellers or freedivers to check out while scuba divers can explore the deeper areas. Baby reef sharks, turtles and all kinds of colourful reef fish are lurking in it. Beyond the resort's lagoon, the waters of South Ari Atoll are also a dream for divers to explore. The atoll is renowned for having fantastic dive sites and also being an excellent location for spotting whale sharks during the right season. Don't let the name out you off, whale sharks eat zooplankton and aren't aggressive. But yes, they are massive. Centara Grand Island Resort and Spa brands itself as a ‘premium four star resort’, which essentially means it offers a pretty high standard of accommodation and services not far off a five-star. In fact the ‘Island Club’ option at Centara is a ‘resort within a resort’ concept, leaning more towards a five-star option. The Island Club villas are the highest category of villas at the resort, and Island Club guests are offered various exclusive services, such as use of the island clubhouse and a wider choice of beverages including premium spirits. Furthermore, Island Club guests get exclusive use of an extra swimming pool, served by staff who can bring cold towels, fresh fruit, sorbets and almost anything else you desire while you relax in the sun. Guests are offered the option of booking their holiday on an all-inclusive basis, which includes dinner at three out of the resort’s four restaurants and a range of beverages including cocktails. 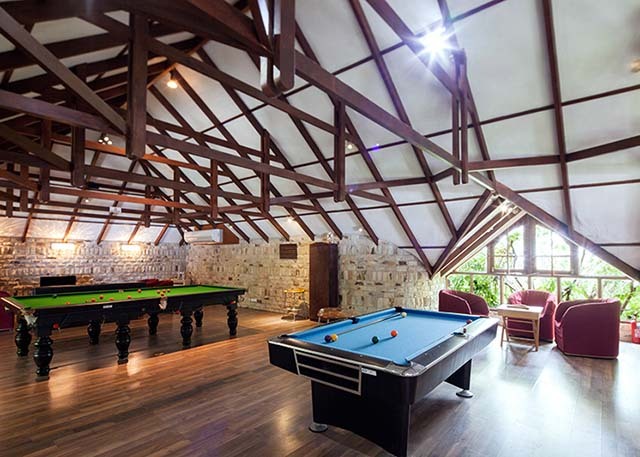 Every villa at the resort has a living room area, rain shower, bathtub or Jacuzzi, flat-screen satellite TV, minibar, internet access and terrace. 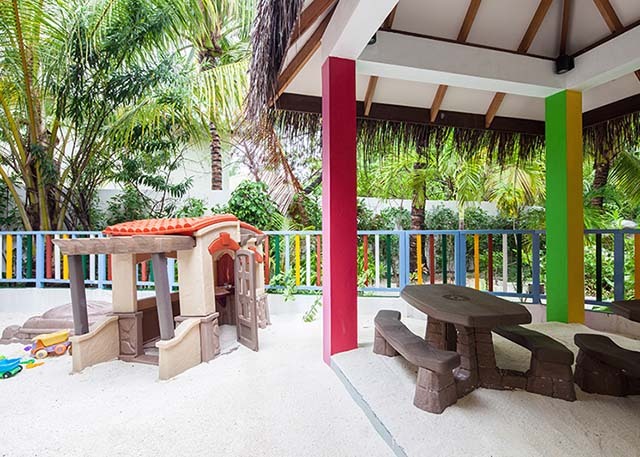 They are all colourfully furnished in a mix of colonial and modern styles which captures the holiday island atmosphere perfectly. The Beach Suites have two floors connected by a staircase, while one of the key features of the Deluxe Water Villas is a Jacuzzi spa. The Deluxe Water Villas – Island Club have slightly different décor and offer access to the exclusive Island Club facilities and services. The Deluxe Family Water Villas are spacious and contain a separate area for kids, complete with a games console. 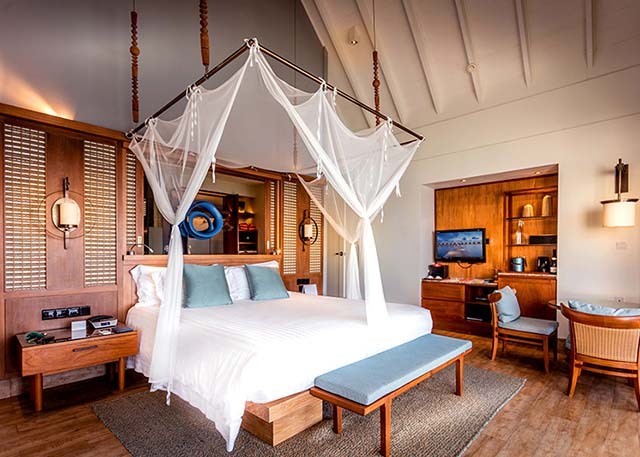 The Luxury Sunset Water Villas are split over two levels and have romantic four-poster beds, while the Luxury Sunset Water Villas - Island Club are also split over two levels but have slightly different décor. Guests staying in these villas also have access to Island Club facilities and services. The Two Bedroom Beach Front Pool Villas are the largest villas at the resort and highlights include a beautiful 21.6 square metre pool. The bright and airy Reef restaurant, with panoramic views of the ocean, offers a range of Asian and European cuisine, while the atmospheric Lotus Restaurant, specialising in delicious Thai cuisine, is hidden amongst the exotic vegetation. Obviously the Thai food here is top-knotch. The Italian restaurant, Azzure Mare, is a romantic and atmospheric spot overlooking the turquoise lagoon. Entertainment is regularly put on at the Coral Bar, while the quieter Aqua Bar is the ideal place for a sunset cocktail. You can drop the kids off at the kids or teens club too while you enjoy some quality time. The kids club is typical of most kids clubs, they offer arts, crafts and activities. The teens club (E-Zone) is more of a chill-out lounge for 13-17s with some games, computer games and beanbags to relax in. It's really nice to see teens given that level of respect and consideration as they are often overlooked. Centara enjoys a very good reputation in Thailand, where it is headquartered, as well as overseas. No Thai-owned resort would be complete without a good spa, and Spa Cenvaree does not fail to deliver. The attractive spa offers a wide range of treatments and is the perfect way to unwind.